Umcka ColdCare Menthol Syrup / 8 oz - Nature's Way®. Pelargonium sidoides 1X – the main ingredient in Umcka ColdCare – works with the immune system to help support the body’s own natural defense mechanisms. That means you’re getting a medicine that works safely with your body – not against it. Why Umcka ColdCare Mint-Menthol Syrup? Easy-to-swallow, delicious relief for cold symptoms. 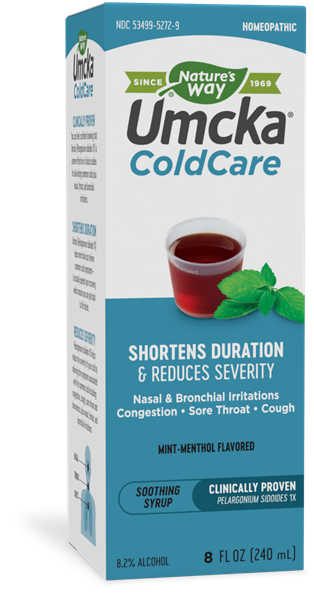 Umcka ColdCare Mint-Menthol Syrup is a soothing liquid formula that reduces the severity of throat, nasal and bronchial irritations including cough, congestion and sore throat. This delicious, easy dose syrup is ready to take on your cold symptoms. Adults and children 12 years of age and older: Take 1 1/2 teaspoons (tsp) (7.5 mL) 3 times daily.